This Antwerp-based gent is not only a great designer but also a top showman. His budgets have nothing to do with the LVMH and Kering financed extravaganzas with exclusive soundtracks and elaborate show settings that have been rented, arranged and prepped weeks prior. 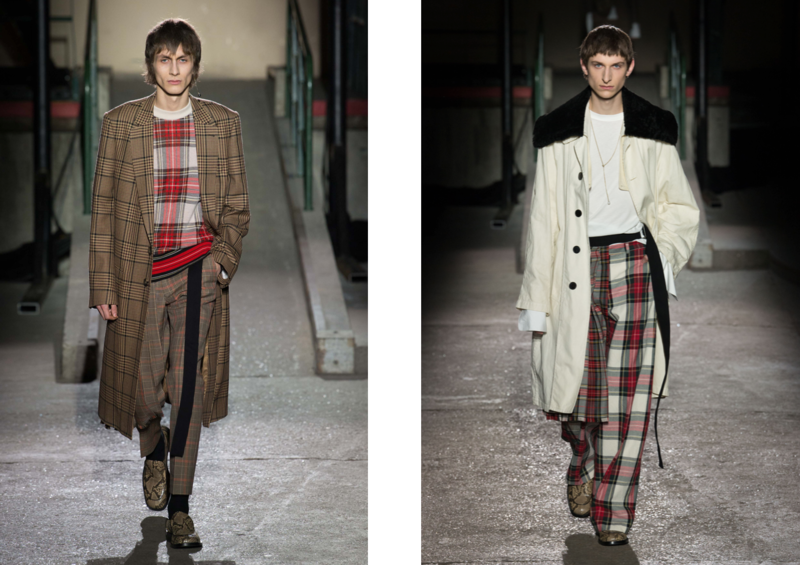 No, Van Noten shows still have that underground Parisian fashion vibe that takes you back to the early 90’s of Jean Colonna and Helmut Lang. 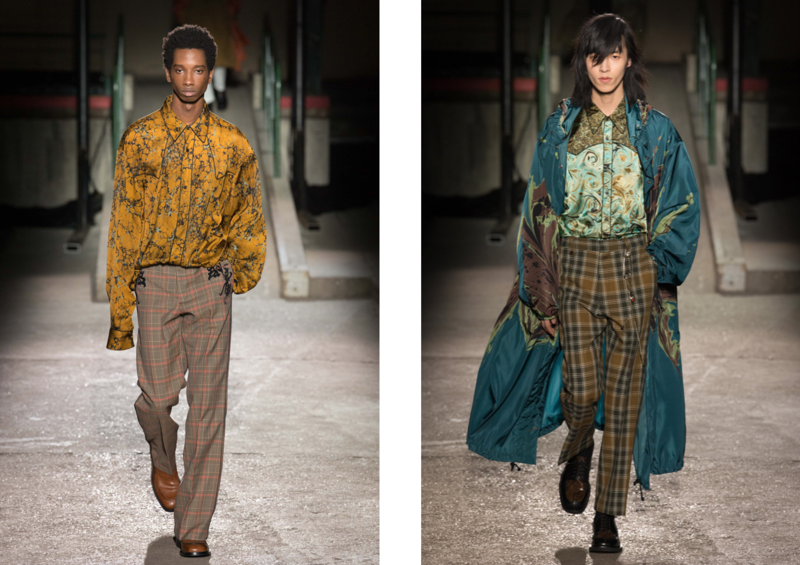 Van Noten likes garages, school courtyards and industrial locations or for this show a former sorting office of the French Post and Customs and Excise. Through minimal use of lighting, sharp choreography and excellent sound he manages to elevate his clothes to deliver fashion moments. I mean, why can’t anyone else think about his or her show finale a little bit more and try to do something different? Last night the shadows of the models at the end of a classic men’s wear show were haunting and made for the extra cool factor others try so hard for. 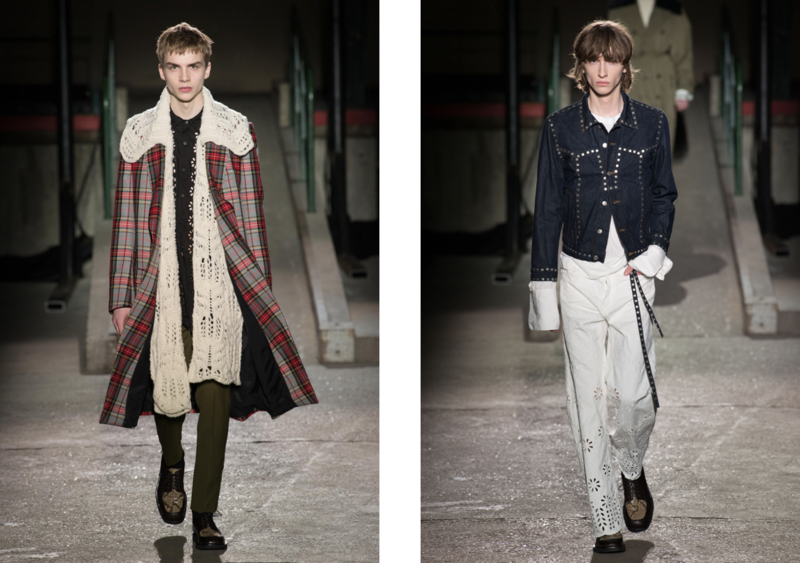 “I wanted a classic men’s show with Prince of Wales, Tartans and checks. 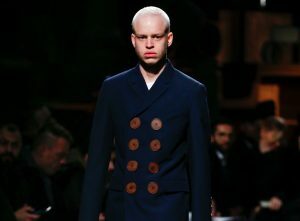 All the English fabrics I love and then bring it to how we feel about them now” explained a slightly bearded Van Noten backstage. To give these fabrics an interesting spin, he deftly worked on the volumes, from maxi coats and jackets to leaner outerwear. Van Noten showed a couple of layered looks at the end of the show that stood out. A knitted cardigan in white whose exaggerated collar covered the coat and Tartan pants were best. Also, in the white section were some laser cut floral whites where the flower was either cut out or in broderie anglaise for a cool contrast. 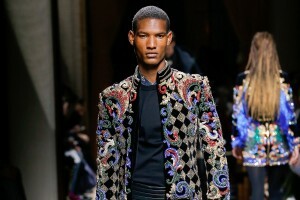 Again without the biggest budget, Van Noten has an unerring eye for casting. He always mixes in lots of ethnic and black guys but the stand out was the cool long side burns with shaggy hair cut on the opening guy. It’s the look of the moment. Kicking off our Milan coverage, we take a look at a savvy new triple L: A Link-up between Larusmiani and Lorenzi. 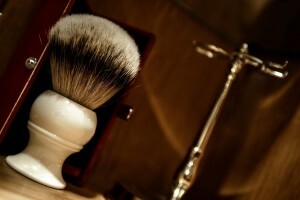 A unique Italian meeting between cutting edge accessoires and razor-sharp tailoring. The fashion marathon is nearing its end and some of the hottest brands are providing one highlight after another. The City of Light is boasting one of the best line-ups ever. 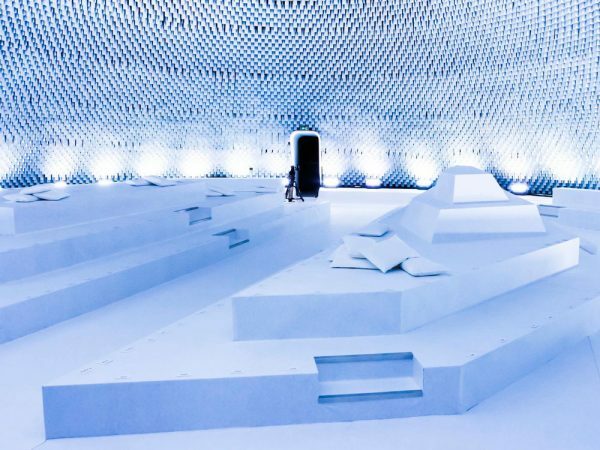 For example cutting-edge fashion from Marine Serre, big-ticket productions from Saint Laurent while still awaiting the emotional climax at Chanel. We’re here to tell you about what matters.